Set in hardscrabble farming country around the show jumping circuit that flourished in Australia prior to the Second World War, Foal’s Bread tells the story of two generations of the Nancarrow family and their fortunes as dictated by the vicissitudes of the land. Their story is one of impossible beauty and sadness, a chronicle of dreams turned inside out and miracles that never last, framed against a world both tender and unspeakably hard. 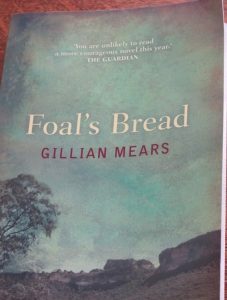 Written in luminous prose and with an aching affinity for the landscape the book describes, Foal’s Bread is the work of a born writer at the height of her considerable powers. I have been savouring this book for months waiting for a time to read it when I felt like delving into the prose that I believed to be powerful and it was just that. Nor did I read the book in a quick time either. Rather I read a chapter here and a chapter there haunted by the descriptions of the landscape and the characters, some of which I warmed to and others less so. Once I got to about three quarters of the way through, I then decided to keep on reading it in almost one sitting. It is a utterly moving book. Full of highs and lows of the Nancarrow family. Noah and Roley’s love story is all encompassing for them. It is a warts and all version of life set in the Australian bush on a property with a jacaranda tree, that I kept visualising. If you are after a book that moves and shocks, then this is perfect for that. I believe I will be reflecting on it for quite some time. Plus I do want to read Mears other books.